Andrieh Vitimus combines his knowledge of NLP and hypnosis with his knowledge of working with the dead to provide a powerful and transformative experience with your ancestors. Halloween and this time of year used to have real religious significance. This transformative experience brought to you on Halloween by Andrieh Vitimus, Jason Colwell, and the Para-x Staff. Experience what it could be like to commune with your ancestors while feeling their love and support. Take this experience and apply it to your magic, your life, and your healing. Interested paranormal investigators who do the service, try to set up your recording, sensor and video equipment around where you are communing with the dead. We welcome the awesome stories. Our Altar for our Show. This was the most awesome podcast I have stumbled upon in a really long time. Thank you so much. I listened Ep. 36 and then 35 because I adore the two people you had on. One of my favorite things is my Ancestor Altar so I had to listen to this. 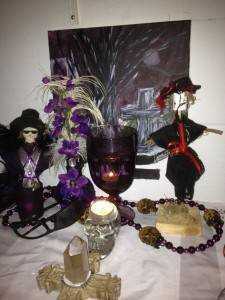 Oh I am so going to do this again at my Altar and you now have an avid new fan! You guys are great. Off to listen to the next Podcast! Seriously thank you so much for this one, I will have to pass it on.